How to Get Rid of Razor Burns (Shaving Rash) Naturally? For those who regularly shave their faces, or other visible parts, shaving rash is one of those things that you become concerned about. It can be annoying, itchy, and just unpleasant to look at in general. But, what actually causes a rash after shaving? Is there a shaving rash treatment? What about prevention? Don’t worry; we’ve got your back when it comes to your face. We’re going to take a look at the causes, treatment, and prevention of razor burn so that you’ll know virtually everything that you need to know about shaving rash. What causes razor burn? It has something to do shaving, obviously, but what actually causes shaving rash? There are a couple of things that can contribute to razor burn, some of which you may have never considered. Razor burn is typically caused by your hair being twisted and pulled rather than cut by the razor blade. This can be caused by numerous things, but the most prominent is the lack of a sharp razor. A dull razor blade may skip cutting a hair and pull it while you are dragging it along your face. Bacteria might be behind your skin irritation. This can come from a dirty razor, dirty hands, or even from dirt and bacteria on your face. The bacteria can be dumped into your freshly opened pores. A poor shaving technique can also contribute to razor burn as it can lead to the pulling and twisting of hairs mentioned above. Many experts recommend shaving with the grain to avoid burns and ingrown hairs. Your particular shaving rash may just be caused by sensitive skin. It could be a reaction to your shave gel or your aftershave. It could also be an allergic reaction to something on your razor. These causes are pretty typical for shaving rashes. With that in mind, there are a number of treatments for shaving rash that can help clear it up quickly. As you can see, most causes of shaving rash are pretty typical, and some are even just common skin issues. The good thing about that is it means that a number of common treatments for skin treatments will work as a razor rash treatment. Due to its anti-inflammatory properties, apple cider vinegar could help clear up razor burn. Take a cotton ball and dab it into some apple cider vinegar. Apply the vinegar-coated cotton ball to the affected area. Do this two to four times a day until it fades away. If you have sensitive skin, you may want to dilute the apple cider vinegar with some water. Your shaver rash may be relieved by something as simple as a cold compress. Take a cloth, soak it in cold water, and then place the cloth on the rash. Alternatively, you can take a cloth and place some ice cubes in it. Aloe vera has long been used a skin treatment for various skin issues. To use for razor burns, take a fresh aloe vera leaf and place it into the fridge for a few hours. Take it out and snip off the end of the leaf. Squeeze out the gel. Rub the gel into the rash, and let it dry before removing. Apply this method a few times a day for a few days to take care of the shave rash effectively. Aspirin may help get rid of your rash due to its anti-inflammatory properties, but the way you use it may be a little different than you are expecting. Take two aspirins and drop them into a teaspoon of warm water. Let them sit for a little while, and then crush the aspirins into a paste. Apply the paste to the affected area and leave it for approximately 10 minutes. Try this method for a few days. Natural honey has both antibacterial and anti-inflammatory properties, so it could be ideal for most causes of shaver rash. Take some natural honey and apply it to the area that you want to clear up. Leave it for 15 minutes and then rinse it off with warm water. Try this for three to four times a day for as long as the rash persists. Black tea can also help tame razor burn. Make a cup of tea (why waste the teabag? ), and then place the teabag in the fridge to cool for at least five to 10 minutes. Take the bag out and run it over the area of razor burn. Do this a couple of times a day for as long as needed. Now that we’ve taught you how to treat shaving rash, it may be a good thing to teach you how to prevent it from happening in the first place. It may be hard to believe that there are ways to prevent shaving rash—due to the nature and number of things that can cause it—but there are. Here are quite a few of them to keep in mind. As we noted earlier, a mistake that many people make when shaving is shaving opposite the direction of the hair growth. The idea behind this is that going against the grain will get you a closer shave, but it can also easily cause shaving rash. And you can get just as close a shave by using a sharp blade and going with the grain. Going against can cause the razor to pull the hair, which can cause the irritation that becomes shaving rash. The steam and water generated by a warm bath or shower can help you avoid razor burn in a couple of ways. It helps soften your hairs, making them easier to cut. It will also help raise the hairs against the skin, making them easier to get to. Using a lubricant to shave will hydrate your skin, which can help keep your skin less irritated. While shaving cream works best, soap and water will also work well. Another mistake many people make is using long, dragging strokes to shave. It’s better for your face to use short, light strokes. The short, light strokes are less likely to pull hair and damage the skin. It may go without saying at this point, but use a sharp blade when shaving. A sharp, clean blade is more likely to cut than pull the hair. While you should use warm water to prepare to shave, cold water can help you afterward as it can help close your open pores, which gives infection-causing agents less time to get in and cause irritation. What shaving rash most often comes down to are poor shaving habits. Everyone who shaves has their own rituals and techniques for achieving the closest shave. However, you may be doing something wrong. Hopefully, the tips we have presented here will not only help you treat your shaving rash, but will also prevent it from happening in the first place. Villimovsky, M., “How to Treat and Avoid Razor Burns: The Ultimate Guide,” Medlicker, August 10, 2016, https://medlicker.com/1153-razor-burns#what-causes-razor-burns, last accessed May 16, 2017. “How to Get Rid of Razor Burn Fast,” Top 10 Home Remedies, http://www.top10homeremedies.com/how-to/get-rid-razor-burn-fast.html, last accessed May 16, 2017. Scheve, T., “How to Prevent Shaving Rash,” How Stuff Works, http://health.howstuffworks.com/skin-care/men/shaving-tips/how-to-prevent-shaving-rash1.htm, last accessed May 16, 2017. “How to Prevent Skin Irritation After Shaving,” WikiHow, http://www.wikihow.com/Prevent-Skin-Irritation-After-Shaving, last accessed May 16, 2017. 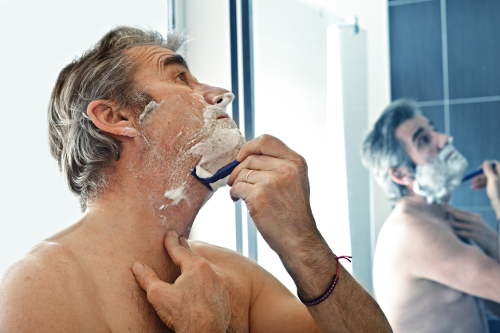 McMillen, M., “What Men Don’t Know About Shaving,” WebMD, http://www.webmd.com/men/features/mens-shaving-tips#2, last accessed May 16, 2017.